Both Lunning Funeral Chapel and Hansen-Spear Funeral Home are like many other firms across the United States: . They truly believe in the vision and messaging around the “Have the Talk of a Lifetime” campaign. Looking into their arrangement rooms, and in various parts of their facilities, you’ll find brochures and other handouts encouraging families to “Have the Talk of a Lifetime”. The challenge they face isn’t broadcasting the value of the campaign within the walls of the funeral home, it’s extending their outreach beyond their front door. “The Talk of a Lifetime is a gateway for families within our community to openly discuss their end of life wishes. This ultimately leads them to think of us and how their local funeral home can help. The issue is that we need to educate, and engage, our community to take action”, says Rochelle Swanner at Lunning Funeral Chapel. Consumer behavior is changing rapidly. Cremation rates, perceived values of funerals and many other factors are the driving force behind this change. One of the best ways to counter this change is through public awareness and education. 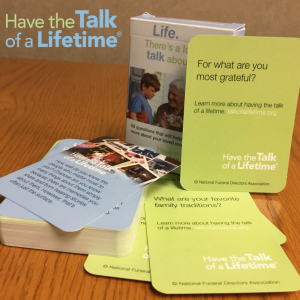 “Have the Talk of a Lifetime” is a perfect example of a campaign that can have a lasting impact within a community. Countless families have been helped through the campaign, but the underlying challenge is getting the message to the masses. Consumer education in general is a fundamental issue in funeral service. The public doesn’t generally want to think about death and most local funeral homes do not want to push the subject into the forefront. This leaves a huge education gap and places families at risk of making poor decisions due to lack of education. “Nearly every day is pressed for time. Our staff is devoted to helping the families we serve, and there just isn’t enough time in the day to take the time to bring awareness to another initiative,” says Will Spear from Hansen Spear Funeral Home. The challenge surrounding the “Have a Talk of a Lifetime” campaign is the tip of the iceberg. There is a much larger community outreach problem lying beneath the surface. Traditional offline methods such as newspaper, radio and direct mail have dropped in effectiveness over the years. “With everyone seemly going online, we must meet our communities on social media and through email. The challenge is that this is a new frontier for us and we simply do not know where to start.”, says Rochelle Swanner. The Facebook game has changed, so going online isn’t as easy as it once was. Both Lunning Chapel and Hansen Spear shared posts from the “Have a Talk of a Lifetime”’s Facebook page. The hope was that by sharing the posts to their Business Facebook page, this would spark a conversation and increase community awareness. Unfortunately, the net result was that the posts didn’t achieve the reach they were hoping for. The real cost of not finding a solution is that both Lunning Funeral Chapel and Hansen Spear wouldn’t have a repeatable process to reach their communities on important topics. With traditional offline outlets becoming more expensive, and less effective, what is next? The inability to find a way to reach their communities online places their business at risk over time if someone else is able to connect with their community in ways they can’t. Our team at Funeral Innovations worked with the staff at Lunning Chapel and Hansen Spear to run an experiment in their communities. The intention was to have a short runway and test how we can help them achieve their goals of community outreach without asking them to lift a finger. The last objective was the most important. Both firms were busy helping families and didn’t have time to devote to our pilot. So we had to go to the drawing board to keep it turn-key for them. After much discussion, we felt that this experiment was suited for one of our Growth Engine Giveaway Campaigns. We went to the “Have a Talk of a Lifetime” website and searched for something of value we could offer in exchange for contact information. The Conversation Cards caught our attention and we felt they would make the perfect lead magnet. Who doesn’t love raffles on Facebook? The final conclusion was that we would allow community members to enter their contact information in exchange to win one of two free Conversation Card decks in a raffle. There would be no cost to enter, just their contact information would need to be provided. We created a set of Facebook ads that we ran in the communities of Lunning Chapel and Hansen Spear Funeral Home. These ads didn’t show up on their Facebook pages, but where run as “dark posts” that only show up in the news feeds of targeted Facebook users. A very targeted audience was set for each community. We not only focused on location but also age and gender. It was important to keep this affordable, and repeatable, so we set a max ad budget of $100. We planned to stop the campaign at 10 leads to determine how quickly they got to 10 leads and the cost per lead. This experiment turned into a smashing success. We were able to achieve 10 leads for both firms with spending less than half of the ad budget. Below are the stats associated with each stage of the funnel for each firm. Of the numbers above, the conversion from clicks to leads was higher than expected. Lunning Funeral Home converted 71% and Hansen Spear converted 57% of the visitors taking the click to the landing page into leads. Since this experiment wasn’t focused on preneed contracts, none of the leads were contacted. In a future experiment, it would be good to test reaching out to each lead who was not the winner of the raffle to extend a Conversation Card deck to them anyway. This would start a conversation with the lead and possibly convert them into a preneed contract. Facebook is a viable solution to bring awareness to initiatives that are important to the funeral home, but need help distributing to your community. Facebook ads are critical. Having a strong call to action from the Facebook ads allowed a higher conversion rate than simply “boosting” a post. 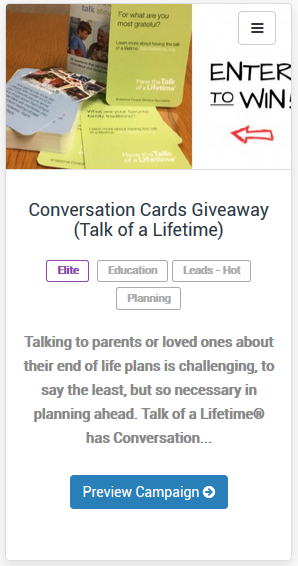 As a result of this experiment, we added a Conversation Cards Giveaway (Talk of a Lifetime) Campaign to our Growth Engine. This allows our other partners to achieve similar success with a click of a button.